After Debra dropped a shocking, shrapnel-ridden bomb at the cliffhanger conclusion of last week’s installment of Dexter, “Chemistry,” we have all been at the edge of our seats in anticipation of the aftermath explored in this week’s deservedly-hyped “Argentina.” Not only were we confronted with that aftermath—we have found ourselves in the midst of an entirely new equation, the variables of which are as indistinct as the emotions of our now thunderstruck Dexter and Debra. Does the truth set free? Does any escape truly offer nirvana, or do we ruin that nirvana with the baggage we inevitably bring wherever we go—just by being in our own skin and feeling what we feel? If you’re still reeling from the thrill of the new ride, try to ground yourself with the mini-synopsis below, followed by an in-depth review of just what is spinning into fearsome motion with this episode and the sharp stab of a surprising double-edged sword that’s changed the nature of everything! Welcome to the colorful land of “Argentina”—where nothing is sacred and nothing is safe. CAUTION: SPOILERS AHEAD. MORE SCREENSHOTS COMING! Tonight… really was the night. No, not one of those nights. We toss around the word game-changer in reference to anything that causes the water to stir; consequently, its meaning really gets compromised. When using “game-changer” in the context of tonight’s episode of Dexter, however, it regains significance. Immensely so. For suddenly love, in Dexter’s wild little world, isn’t just a matter of being accepted. It’s learning to accept. It’s learning to reciprocate that one thing he has always desired, even when it seems wrong—or “inappropriate,” in the words of the lovelorn Isaak during he and Dexter’s mini-tryst at the bar. Love is no longer simply a matter of reason, but a matter of choice, often the one that is the most baffling and beyond explanation. “Love defies reason,” so Isaak says. Dexter may not realize that he’s being challenged to stand and face the music with Debra, but he is getting absolutely schooled in this area of his life by some truly uncanny individuals. He may be running right now, trying to establish himself with Hannah in the way that Hannah has established herself with that strange, capricious dream of an idyllic Argentina; yet, his need to solidify his loyalties and put his new dreams to the test will soon be catching up with him. In the meantime, the teeth of this need are becoming sharper and sharper. The further he runs, the further those teeth will sink by the time they inevitably meet his pace when he finally can’t intensify it any more. Dexter may have said “I don’t run; I make people run” in regards to Speltzer, but he’s running more than he realizes, and causing more hurt in his wake than in his surge. Before diving further into the incredible upsets in the worlds of Dexter and Debra regarding truth, love, sacrifice, and all that mad, mad jazz, let’s take a couple of steps back to look at how all of the subplots are starting to converge and become enmeshed as a pretty chaotic sort of symphony. Dexter continues to stoke the flame between him and Hannah, entrusting her with the knowledge of both his kills as well as a particularly relentless foe whose thirst for vengeance will only be sated by seeing him killed. Little by little, the whole of Dexter’s dark-tinted world is starting to be illuminated for Hannah, who reacts to these revelations (i.e. his relation to Debra and his family) with a rather unreadable astonishment but seems to adapt as quickly as she professes she’s able to. Dexter—unafraid of plunging into his sinister depths a woman already well accustomed to the dark—is seeking to milk this newfound comfort of what it’s worth. To him, the comfort she provides is his only home; the arms that have been open for him all along seem, to him, too tender to shoulder his burdens. This is his “Argentina;” a little slice of utopia, sprinkled with enough sense for him to substantiate the fantasy. Unfortunately it just so happens that he has succeeded in putting a bitter end to Isaak’s Argentina, and that isn’t something he’s going to let slide. Though he and Dexter may have a sort of affinity in that they’re both on the “periphery” of things, this doesn’t acquit Dexter of his actions. Consequence is an enormous factor at play in this wide-eyed adventure of an episode. For instance, the consequence of Isaak’s dedication to revenge is betrayal by his own Brotherhood, as is evidenced by George’s clandestine call to a man whom Dexter actually takes out in the process of trying to get Isaak himself. Isaak is a viciously efficient and self-driven nonconformist who refuses to be defined by any kind of organization; he, like Dexter, is bound to his own code in his ethics, status, journey, and even sexuality. Just as Dexter is seeking to find a kind of emotional belonging, Isaak is seeking to rectify the loss of the emotional belonging that was once his because of Viktor. The parallels between the two are extremely rich and not only enable us to comprehend Isaak but also sympathize with him on a surprisingly deep level. As far as consequences go, Dexter is very naïve, and the scenes in which Isaak subverts Dexter’s rigid worldview with his own fluid, passionate understanding of things shows Dexter’s need to consider bucking his own system to really find himself and what makes him belong. Considering the fact that Dexter very narrowly escaped getting a bullet through his skull on an innocent doughnut run, the two have such a neat common ground on which to explore the world in which they are outsiders. So we return to the ultimate moment of truth: Debra finally tears back the veil to let Dexter see who she truly is and just why his choices are causing her to become completely unraveled. What a phenomenally executed scene, let me just say. Jennifer Carpenter has such an unbeatable capacity for reading the way that Debra needed to deliver that truth—her disbelieving, sardonic laughter, her tears, her breathless confessions, compounded with fear and guilt and despair and hope… it was an absolutely overwhelming experience for me and I imagine for everyone hugging themselves through this soul-pinching moment of sheer honesty! Of course, Dexter, perfectly shell-shocked, can only parrot her words—“You’re in love with me?”—and follow them up with speechlessness, maybe even alexithymia (the inability to verbalize emotions). Debra’s tripping over her own heart, afraid to admit that she might still be in love with him on some incomprehensible level after everything she now knows to be true. Yet, the truth seems to take on a mind of its own and comes through her and almost IN SPITE of her. Her feelings have been left fermenting inside her all this time, and trying to deny them in the face of one of the most enormous hurts she’s ever stomached would be a near suicidal endeavor. 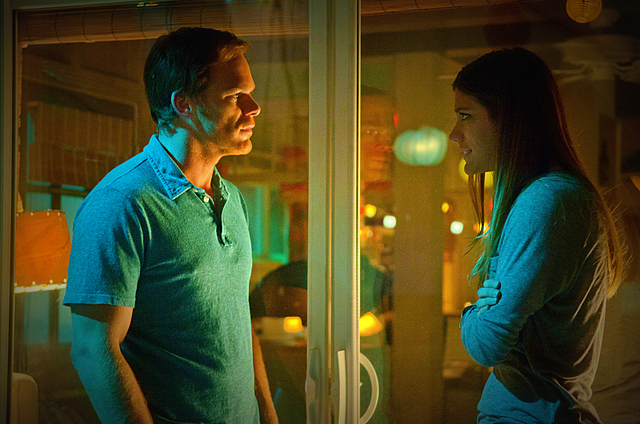 What hurts the most here is that Dexter insists that he doesn’t want to hurt her but doesn’t know how to give up or reassess the new solace he's gained in Hannah. He doesn’t understand how Debra could understand him enough to love him through his vices; logically, his chemistry with Hannah is—however volatile—what makes sense. When Dexter takes off and grapples with the admonitions of a surprisingly-not-grossed-out Harry and confronts Isaak’s advice, however, we see in Dexter a need to embrace the beauty in that which seems irrational, abnormal, or totally out of the question. He isn’t yet ready to get over the mirage of Argentina and let himself understand and be understood by his true family—he’s a man on the run with a certain illusion of what home should truly be. The question is: is he going to let himself discover what it means to have a home, and what it means to love and be loved when it doesn’t make sense? Maybe some loves really do transcend chemistry. Maybe some transcend quantification, and people don’t need to be qualified to make things work; to know and uphold one another. Maybe Argentina is just a pretty picture on an outdated calendar, and it’s time for someone to breathe the smelling salts and learn to find their place with the ones who need them most.